October is National Bullying Prevention Month. One type of bullying is cyberbullying. 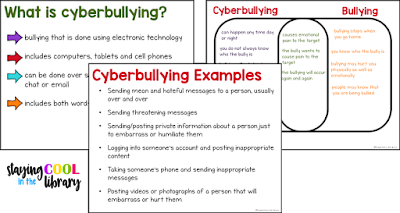 With technology becoming more enmeshed in every aspect of our lives it is more important than ever to teach our students what cyberbullying is and what to do if you are a victim of a cyberbully or witness this type of behavior. A few months ago I wrote a blog post titled "10 Anti-Bullying Picture Books" where I give a list of some of my favorite books to teach younger students about bullying, including cyberbullying. 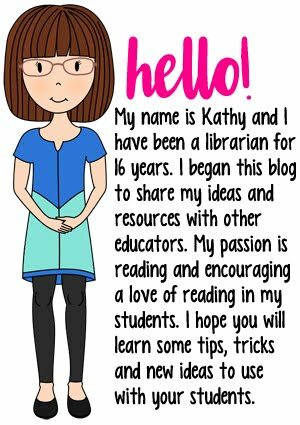 Today I want to share with you some lesson ideas and activities that you can use with older elementary students. Videos can be a very effective tool in introducing a topic to students in an engaging way. There are several cyberbullying videos that I have used before. I like them because they are the perfect way to begin a conversation and open up communication with students. 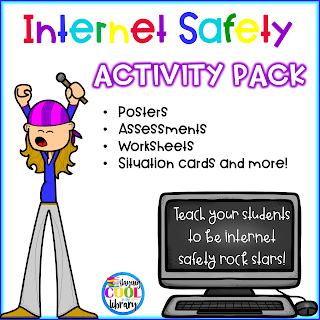 My school subscribes to BrainPop and there are several different videos on there about digital safety. But if your school does not have BrainPop, there are some free videos that you can use. And as always, please preview any video before you show it to your students. Many of the video links are from youtube. However, if you do a search for the video you may be able to find them hosted on other sites. Cyberbullying and Prevention: This video is from the FTC and is less than 2 minutes. NetSmartz is an online curriculum resource that provides in-depth lesson plans and materials to teach students all about digital safety, including cyberbullying. One is titled Terrible tEXt and discusses what to do if you receive a threatening or mean text message. This video is actually a 50 second commercial from the AdCouncil. It would make for an excellent lesson introduction on the topic. Here is a youtube link to the video: Cyberbullying Prevention Commercial. This video is titled The Cyberbullying Virus. It is less than 5 minutes and does focus more on the "mean girl" syndrome. I would show it to 5th graders or middle school students. This website from the Cyberbullying Research Institute has many different cyberbullying videos on it. Some of the videos are not appropriate for elementary students, but several of them are. One is called Digital Smile Cards and talks about a way to promote positivity in school. Pause and Think and The Common Sense Census are some others. Planet Nutshell is a company that produces various animation videos. They created quite a few internet safety videos for K-12 students. The videos have suggested grade levels. Click here to look at them. There are several videos on this PBS site about cyberbullying, but the most useful resource I found is not a video at all, it is more of an interactive slideshow. It is the first link on the page. You could easily do this as a whole-class activity or have students work on it individually. There are a couple of videos embedded in the slideshow as well as different places for students to type in responses based on what they have learned. I had to sign up for a free account in order to access it. Students can also have an account to save their work. Click here to take a look. Bullying No Way is an Australian site with many different educational activities and lessons. There are several videos, discussion questions, writing ideas and more. American Federation of Teachers has a list of useful educator resources about online Safety and cyberbullying. 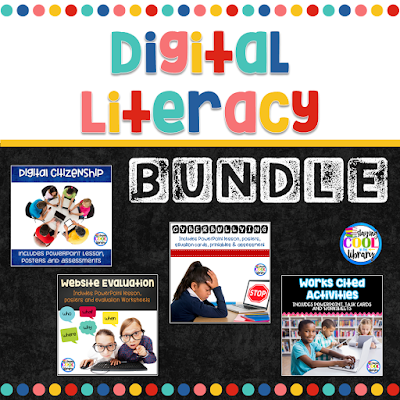 I also have several digital literacy products in my store including one on cyberbullying. 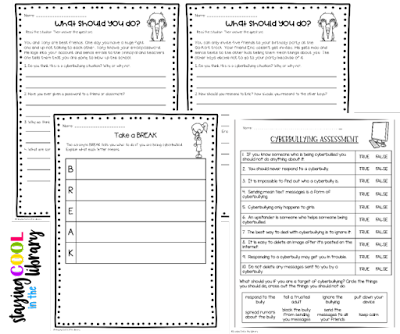 3 situation worksheets (I chose 3 situations from the cards and put them on a worksheet. Students will need to answer some specific questions about each situation). In addition to learning what cyberbullying is, students need to learn strategies on how to deal with a cyberbully safely. 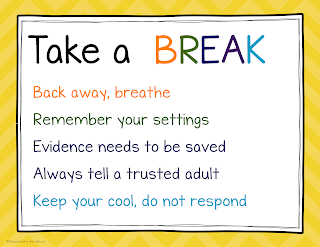 To help students to remember I came up with the acronym BREAK. The PowerPoint discusses the BREAK acronym but also goes over vocabulary like bystander and upstander. 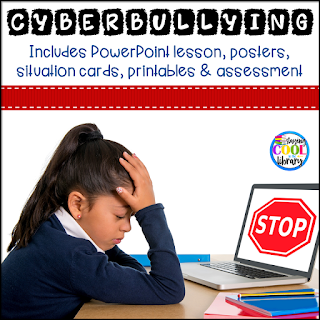 Students will also learn the differences between bullying and cyberbullying and read examples of cyberbullying. There are 8 situation task cards that can be used in a variety of ways. You can use them as discussion starters with the whole class or as a writing prompt. You can have students work on the cards as a small group or center activity. In addition to the situation cards, there are also worksheets for students to write out their thoughts on some of the situations presented on the cards as well as two different assessments. This cyberbullying PowerPoint is part of my digital literacy bundle along with Digital Citizenship, Evaluating Websites and Plagiarism/Works Cited Activities. 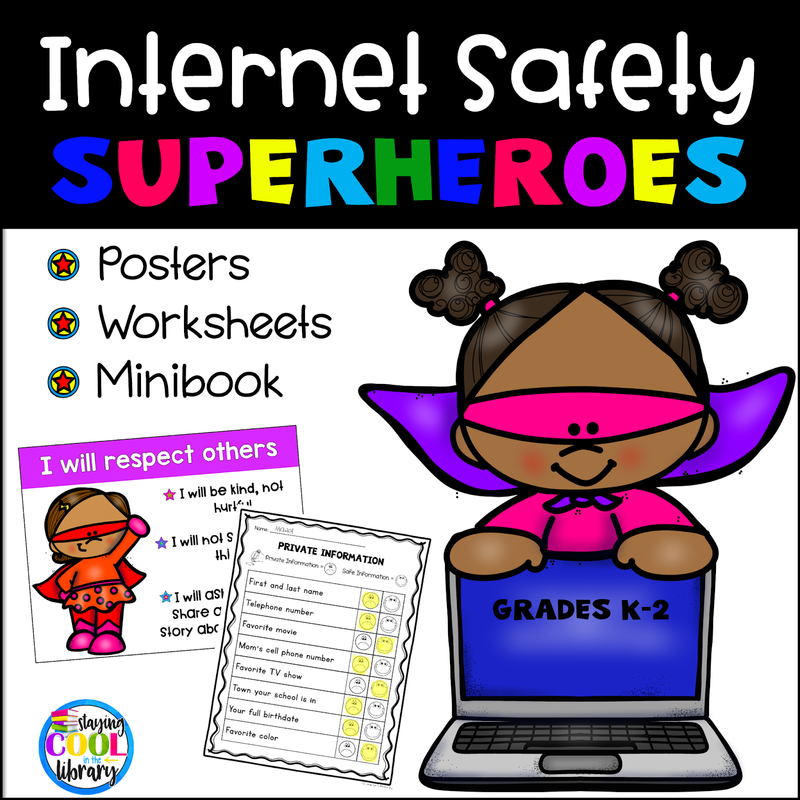 I also have an Internet Safety Pack for both lower and upper elementary students. 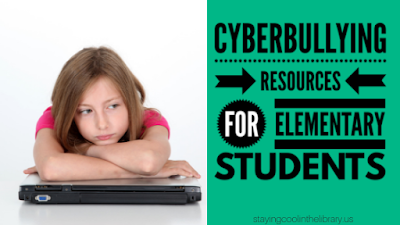 Both of these resources touch on the subject of cyberbullying. 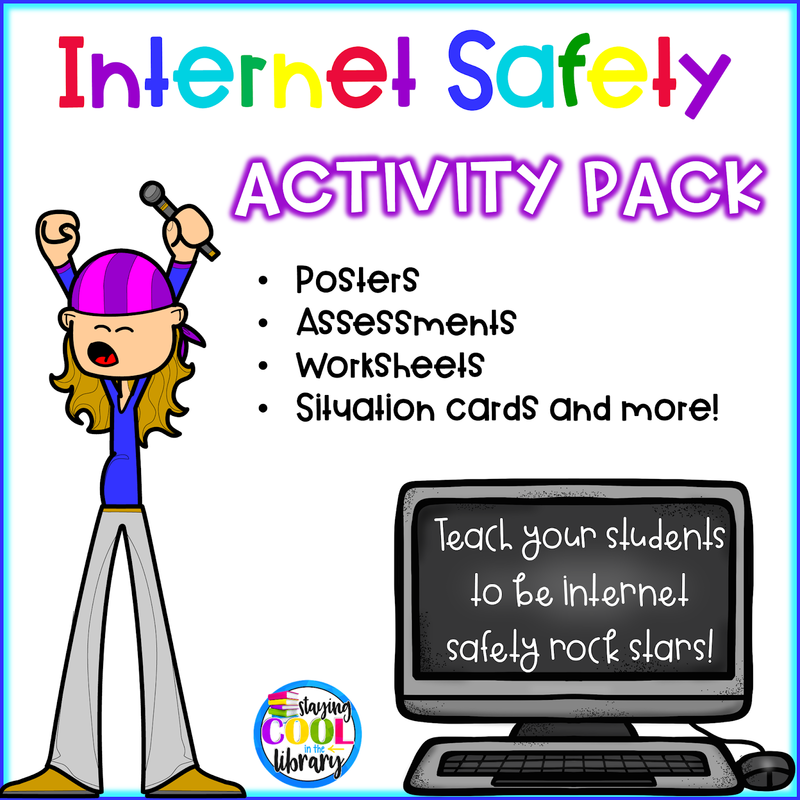 You can find all of these resources in the Digital Safety category of both my TpT and my online store. If you made it to the end of this post then you deserve a freebie! 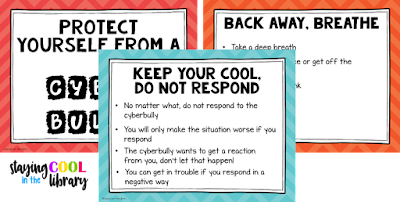 I created a free cyberbullying poster for you to download and display in your classroom or library. Just click the image below to download.